Iranian President Hassan Rouhani says Iran and Iraq are determined to further expand their mutual ties in various areas, as the expansion of ties between the two sides serves the regional stability and security. Rouhani made the comments during a joint meeting of high-ranking Iranian and Iraqi delegations in Tehran on Saturday. President Rouhani described the current mutual ties between Iran and Iraq in power, energy and railway areas as significant and said the two sides should develop new plans to expand their preferential trade deal and pave the way for free trade between the two neighbours. “Establishing joint industrial towns and inviting the two sides’ entrepreneurs and investors to launch joint projects and start cooperation in setting production standards will prepare the ground for further trade relations between Iran and Iraq,” he was quoted as saying in a report by president.ir website. He then called on the participating delegations to develop plans to dredge Arvand Rud or Shatt al-Arab (a river of 200 km in length shared by Iran and Iraq) in the next coming months. President Rouhani said facilitating banking ties between Iranian and Iraqi central banks could pave the way for further financial transactions. He noted that Iran is completely prepared to share its experiences in technical, engineering as well as housing, power plants and dam building with Iraq. He expressed hope that the volume of trade between the two neighbouring states could hit $20b in the coming years. The Iranian president then referred to Syria’s security and said Iran and Iraq, as two major regional players, are seeking to establish stability in the whole region. “Restoring complete stability to Syria is highly significant for Iran and Iraq as two major regional players,” he noted. Rouhani also touched on the issue of Jerusalem al-Quds and said the Islamic Republic of Iran deems the holy city as the permanent capital of Palestine and said Iran condemns any move violating Palestinians rights over al-Quds as their capital. He then referred to Golan Heights and described it as an inseparable part of Syria occupied by the Zionist regime. “No measure can violate this clear-cut historical fact,” he said, indirectly referring to the latest provocative move by US President Donald Trump who said Washington will recognize Israel’s sovereignty over the occupied territory. He also touched on the Yemen crisis and said political solution is the only way out of the current bloodshed in Yemen. “I hope we can launch joint projects to send humanitarian aid to Yemen and restore peace and stability to the country,” he noted. 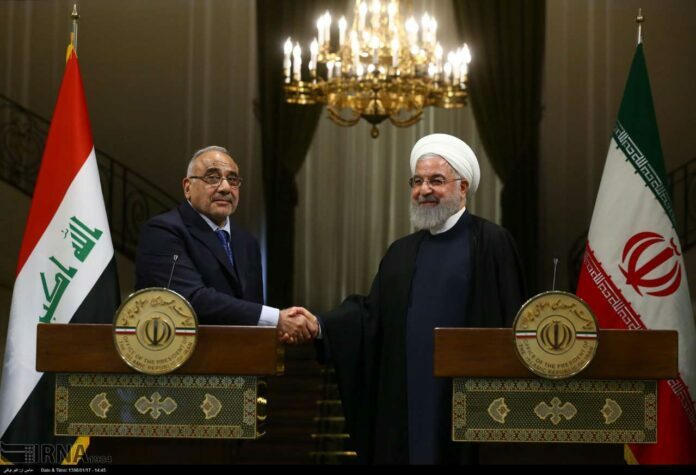 For his part, Iraqi Prime Minister Adil Abdul-Mahdi paid gratitude to the Iranian government and nation for their warm hospitality and described the latest visit by Iranian president to Iraq as significant and historic. “The visit had a host of achievements and removed the obstacles on the way of further expansion of mutual ties between the two sides,” he said. He said following up recent agreements made between Iran and Iraq is among the major goals of his visit to Iran, which came a few weeks after Rouhani’s historic trip, adding that Iran and Iraq need to make efforts to establish further cooperation in various political, scientific, economic and cultural areas to meet their mutual interests. He also praised the two sides’ agreement to lift visa fee for the two sides’ travellers and expressed hope that the move could prepare the ground for further contacts between Iranian and Iraqi nations. Abdul Mahdi further referred to the connection of Iran and Iraq railway networks together and dredging of Arvand Rud as two significant projects and said the two sides should make efforts to expand cooperation in various areas including energy, joint water policy, common economic areas, scientific and technological exchanges and fight against terrorism and smuggling. The Iraqi prime minister also expressed the sympathy of Iraqi government and nation with the Iranian nation over the latest deadly floods and said Iran and Iraq should stand behind each other in all conditions because the unity can lead to great achievements. Iraqi prime minister arrived in Iran on Saturday for a two-day stay in the neighboring state. It is his first visit to Iran since taking office in October last year.